Hi again, it’s Said from HPE DEV. Happy December! As we wrap up 2018, I want to offer a quick recap of our very cool event we hosted at HPE Discover Madrid. In this issue, we’ll also highlight several of the new how-to blogs published on the HPE DEV site and look ahead at what we have in store for 2019. At HPE Discover Madrid, HPE launched the HPE Design program. HPE Design is a global program that listens to users to better understand their needs and create intuitive solutions that simplify technology. HPE Design encourages people to question conventional methodologies and deliver better business outcomes by infusing design-thinking and encouraging innovation in everything they do. HPE Discover Madrid wrapped up during the last week of November. The event, which brings together thousands of people from all over the world, is a chance for HPE to showcase its latest and greatest technology and solutions. More importantly for us, HPE DEV hosted two unique areas for attendees – the Hack Shack (complete with backyard! ), and the Design Experience Workshops. At the HPE DEV second Hack Shack for HPE Discover attendees, we offered a variety of challenges designed for all skill levels (entry to expert). 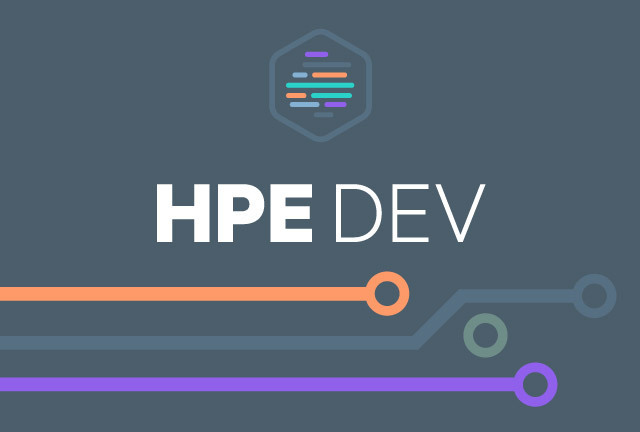 Our unique hackathons, technical workshops, and coding challenges focused on a variety of HPE products, including HPE OneSphere, HPE SimpliVity, and the new HPE Composable Frabric Manager API. HPE Discover Hack Shack had something for everyone! Okay, I might be a little biased, but for me, throughout the week, you could feel the positive energy generated at the Hack Shack! At any point, you could walk in and find people sitting all over the place (even on the floor!) with their laptops, completely engaged in the hands-on workshops and activities. Lots of visitors came by who didn’t have any coding skills…some were intrigued, some just wanted a good expresso, but all left with the message that HPE is encouraging all developers and IT operations to increase innovation by enabling access to software integration projects, resources, and code. On the third day of the event, we hosted a party in the Hack Shack, and the turnout was great! Many of the attendees told us they really enjoyed the activities and were happy to see HPE really starting to engage with developers. At the party, HPE DEV handed out cool prizes to winners of the different hackathons. Some of these prizes included Kano Kits, FitBit Versa smartwatches, and RaspberryPi’s. But my most favorite prize went to the winner of the best Hack created over the 3 days -- he walked away with an advanced performance drone! Looking ahead to HPE Discover Las Vegas in the summer of 2019, HPE DEV hopes to expand the workshops and hands-on activities. We will offer some guided challenges so people of all skill levels (even those who have never coded) will feel more comfortable learning how to improve their developer skills. As I mentioned earlier, in addition to the Hack Shack, we also hosted four Design Experience Workshops during the event. The workshops, designed to help attendees think differently about how they approach their projects, introduced the idea of talking to end users first, instead of jumping straight into developing a solution. Taking this upfront approach allows you to discover the needs and pain points of end users, which helps you avoid interjecting bias and assumptions that often differ from what the end users actually need and want. The response to the workshops was incredible. One attendee remarked that the workshop helped his team realize that they needed to keep the customer’s problems at the forefront when they are developing a solution; it also encouraged them to rethink the way they will be developing new products and applications in the future. The HPE Design team will continue the Design Thinking Workshops at Discover Vegas next summer, with tailored workshops aligned to some of the Hack Shack’s hackathon challenges. At HPE DEV, we had a busy 2018, attending events such as Google Cloud Next, OSCON, and HPE Discover Madrid. Most recently, we attended KubeCon 2018 in Seattle, Washington. The event, which is Cloud Native Computing Foundation’s flagship conference, gathers technologists from leading open source and cloud native communities for four days, to further the education and advancement of cloud native computing. At the event, HPE hosted a free one-day event dedicated to getting hands on with HPE hybrid cloud and container solutions. Open to all KubeCon attendees, the interactive workshops focused on HPE OneSphere, Storage for Containers, HPE Synergy with Image streamer, and Azure Stack from Microsoft. These workshops, hosted throughout the day, proved to be a very beneficial way for attendees to get much clearer product insight and learn how they can interface with them through a common API. Attending and hosting these types of workshops is core to what we do at HPE DEV and the team is already working on our 2019 schedule. I hope to meet you in person while attending one of our event in 2019! The HPE DEV blog is a great place to get the latest news and updates from the community. This month, we had some great articles – one that offered a recap of Discover, some that offered how-to blogs with insights into technical challenges, as well as suggestions on how to solve them. A few articles also looked at some of the higher-level DevOps challenges you may face. Below, find a few of these blogs. Click on the links to read the full articles! HPE Integrated Lights-Out 5 (iLO 5) in Gen10 servers introduced the management of storage controllers via its graphical user interface and the Redfish RESTful API standard. This how-to article addresses this feature with a pure Redfish API approach, bypassing the iLo REST interface tool and its Smart Array macro commands. It begins by explaining how to cleanup and prepare a Smart Storage Controller for receiving a configuration with one or more logical drives, and then goes on to describe how to create a simple RAID array configuration. Read the full article to learn more! Take a behind-the-scenes looks at what went into building the new HPE Design portal for HPE. The goal for the application was to house all things related to HPE's new design program, including all of the various design resources HPE Design offers. Find out how the creator learned the tough way that it’s better to work smarter instead of harder. This article is the first in a series that describes how to use the HPE SimpliVity API. The article focuses on how to use Postman to place HPE SimpliVity REST API calls without writing any code. The goal of the article is to show you how to use Postman to create variables to store the values that you need to use in other Postman exercises and to retrieve the set of virtual machines managed by an HPE SimpliVity federation. Get a first-hand account from the HPE DEV team members who represented the new HPE Composable Fabric in the Hack Shack at HPE Discover Madrid. Find out how they set out to do the impossible: to make network programming comprehensible and accessible. Read this article to learn how truly simple your network can be. Since its beginning in the 1930s, IT has produced systems structures across all levels of technology and its management leading to “Systems Thinking” as the ultimate approach to analyzing structures. But the hybrid world, with digital disruption at its core, is undergoing a seismic shift towards faster co-created services and products. This article looks at how CIOs must build a hybrid culture of Systems Thinking with DevOps into the nature of their operational structure and teams. The article outlines how these principles, working together, will instill a passion for their users and ultimately their customers. Contrary to popular belief, DevOps and ITSM can be incompatible. This article looks at how ITSM is a crucial part of building and maintaining a platform for sound DevOps practices based on people, processes, and technology. The language and terminology used may be different between DevOps and ITSM, but the outcomes are the same – delivering value to the business where it needs it most. We’d love to hear from you! Input from our community determines our focus, so send us your feedback, blogs, and suggestions. Have an idea on how to make our portal more useable? Drop us a line. Have you written a technical article you think other members would be interested in? Send it over! We’re always looking for great suggestions and content. So keep it coming!